Despite the recent collapse of the Washington-Pyongyang summit, worsening prospects for inter-Korea relations, the Ministry of Culture, Sports and Tourism on Monday vowed to “spearhead peace between the Koreas” by making preparations for joint participation in the 2020 Summer Olympics in Tokyo. In a media briefing led by Vice Culture Minister Kim Yong-sam, the ministry rolled out plans that center on cooperation with North Korea in the sports and culture sector, increasing benefits for low-income households, supporting local artists through loans and other forms of support, and boosting tourism by creating new content through technologies such as virtual reality. “While it is regrettable that the summit between North Korea and the US ended without bearing any fruit, the role of culture is necessary if we are to sustain peace between South Korea and North Korea,” Kim said in the briefing at the Seoul Government Complex. The ministry maintains that joint projects with the North in the culture and sports sectors are crucial to better relations with the communist country, after two conservative administrations during which the relationship deteriorated. The two Koreas made history last year by forming their first unified Olympic team for a women’s ice hockey event. The ministry followed up with plans for the joint excavation of an ancient palace site in North Korea, the publication of a joint dictionary and other projects later in the year. Those plans are still in the works. The plans for the Tokyo Olympics include the presence of unified Korea teams in women’s basketball, women’s hockey, judo and rowing, pending approval at the International Olympic Committee’s executive board meeting slated for March 26-28 in Lausanne, Switzerland. It will mark the first unified Korea team in the Summer Games. “We will also push for the South and North’s participation in international events held in each country, joint taekwondo performances, concerts and other fields,” Kim said. The budget for next year has been set at 5.923 trillion won ($5.22 billion), with 1.89 trillion won allotted for culture and the arts, 1.46 billion won for sports, 1.4 billion won for tourism, 829 billion won for content and 330.3 billion won for other sectors. The ministry also hopes to resume the long-suspended tourism program at Kumgangsan in North Korea. The “peace tourism” initiative will include the creation of tourism programs for the demilitarized zone, such as art exhibitions at decommissioned guard posts. The ministry also hopes this will be the year that South Korea finally cracks the 18 million mark in terms of inbound tourists, which peaked at 17.2 million in 2016 before tumbling due to frosty relations with China. While the number increased 15 percent from the year before to reach 15.3 million in 2018, the number of Chinese tourists has yet to recover. Chinese had accounted for nearly half of all foreign tourists prior to 2017, reaching 8.07 million in 2016. “Although we have yet to solve the problem of (not hosting enough) Chinese group tourists, we are hosting a lot of individual tourists. And we are having more visitors from other countries than before,” said Kim Hyun-hwan, the director general for tourism policy at the ministry. However, the ministry has yet to present any specific plans on how to bump up the figure, which seems crucial given that tourism industry projections for Chinese visitors tend to hover between 6 million and 6.5 million. 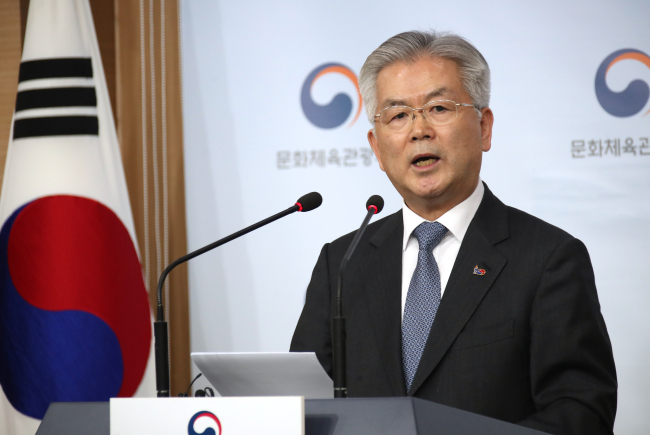 “18 million is more of a figure that shows our determination from the policy perspective,” Vice Minister Kim said. The ministry’s plans for joint projects with the North also hang on improved ties. Although South Korea remain optimistic, at least on the surface, the unexpected collapse of the Hanoi summit may necessitate modifications.